The opioid drug epidemic is a national public health concern. American individuals consume 80% of the world's opioid drug supply and 99% of the world's hydrocodone and illegal drug supply (Manchikanti, Fellows, Ailinani, & Pampati, 2010). Death by overdose is now the leading cause of death by injury, claiming more lives per year than motor vehicle accidents (Dion, 2016; Strain, 2017). In the United States, 90 Americans die of opioid drug overdose daily (National Institute on Drug Abuse [NIDA], n.d.a). According to a statement released by the American Nurses Association (ANA), “registered nurses are qualified and well positioned to play a leading role in assessing, diagnosing, and managing patients battling addiction” (2016a, p. 1). As the largest portion of the health care workforce, nurses are essential health care team members and play a critical role in patient assessment and education, as well as in providing patients with knowledge of alternative pain treatment options (ANA, 2016b). Nurse practitioners (NPs) outnumber physicians in primary care settings and are more likely to practice in urban and rural areas (Buerhaus, DesRoches, Dittus, & Donelan, 2015). Policy and legislation allowing NPs to practice to the fullest scope of their educational preparation may significantly improve access to care for individuals with opioid use disorder (OUD). The purpose of the current article is to offer nurses concise, evidence-based recommendations for caring for individuals prescribed and/or taking opioid drugs. The Drug Addiction Treatment Act of 2000 allowed physicians who took an extra 8 hours of training to treat OUD in the office setting (Substance Abuse and Mental Health Services Administration [SAMHSA], 2018). NPs were not allowed to treat OUD in the office setting until July 2017, when the Comprehensive Addiction and Recovery Act (CARA) was passed. However, the CARA stated NPs must have 24 hours of training to treat patients in the office setting (NIDA, n.d.a). Specific training in knowledge of opioid drugs and OUD is needed across all health care disciplines. A deficiency in knowledge and need for focused education related to opioid drugs has been shown among nurses and other health care providers (Costello & Thompson, 2015). A descriptive study in which 133 nurses completed the City of Hope's Knowledge and Attitudes Survey, a 48-item questionnaire that included multiple choice and true/false style questions, revealed a significant knowledge deficit. Costello and Thompson (2015) noted that only 75% of RN participants answered approximately one half of questions correctly, and less than 30% knew about safe drug disposal practices. Number of years of practice and degree level did not affect differences in knowledge. The only variable in the study that significantly impacted knowledge was content-focused education on opioid drugs. The significant gap in knowledge between nurses who received content-focused education and those who did not included “patient assessment, pharmacologic management, use of adjuvant medications, risks of addiction, risks of respiratory depression, and disposal and storage of opioid analgesics” (Costello & Thompson, 2015, p. 515). The bedside RN conducts discharge teaching to patients and families as they leave an inpatient setting or an ambulatory day surgery clinic. Empowering individuals in the community with appropriate knowledge of opioid drugs is necessary, as many individuals do not realize common practices such as sharing medication are not only unsafe, but also illegal. Discharge teaching needs to comprise education of the opioid medication, when and how to take the medication, possible side effects, legal ramifications of improper use, and safe disposal practices. Massachusetts began a nurse care manager model in 2003 that included the nursing profession in assessment and treatment of OUD (NIDA, n.d.a). This model has significantly improved access to care for those who have OUD by allowing treatment in the medical setting. Treatment for addiction has stigma associated with it and treating addiction in a medical setting decreases the community's knowledge of who is seeking care for this disorder. More than 40 community health centers in Massachusetts now provide assessment of and treatment for OUD through the nurse care manager model (NIDA, 2015). The blending initiative, a joint effort from SAMHSA and NIDA (NIDA, 2015), is an integrated care collaborative partnership among researchers, providers, and policymakers to prevent and treat substance use disorders. As the initiative focuses on incorporating evidence-based practice, clinical expertise, and quality improvement, NPs educated at the Doctor of Nursing Practice level are in prime position to join this effort (NIDA, 2015). Endogenous opioid drugs (i.e., endorphins) naturally occur in the body and aid in pain relief. Opioid is defined as a “natural or synthetic substance” that acts on at least one of three receptors—mu (µ), kappa (κ), and delta (δ) (Strain, 2017, p. 1). Pharmacological opioid drugs act mostly on the µ receptors, causing analgesia effects in the central nervous system and constipation in the peripheral nervous system (Veilleux, Colvin, Anderson, York, & Heinz, 2010). Consuming increasing amounts of exogenous opioid drugs results in increased proliferation of receptors and leads to tolerance. Addiction occurs when the brain becomes dependent on exogenous sources of opioid drugs, such as heroin and prescription pain relievers, including synthetic opioid drugs (e.g., fentanyl) (Veilleux et al., 2010). Even when taken as prescribed, opioid drug use may lead to dependence (NIDA, n.d.b). Chronic use, whether illicit or prescribed, can cause immunological and hormonal effects, hyperalgesia, misuse, and tolerance (Manchikanti et al., 2010). Infection is commonly seen with intravenous (IV) use of heroin, which is a morphine derivative. Regardless of whether opioid drugs are endogenous, exogenous, or synthetic, all opioid drugs commonly cause opioid-induced constipation, sedation, and itching (Strain, 2017). Nurses need to know and understand signs and symptoms of opioid drug use and misuse. Criteria for OUD based on the fifth edition of the Diagnostic and Statistical Manual of Mental Disorders (American Psychiatric Association [APA], 2013) are presented in Table 1. 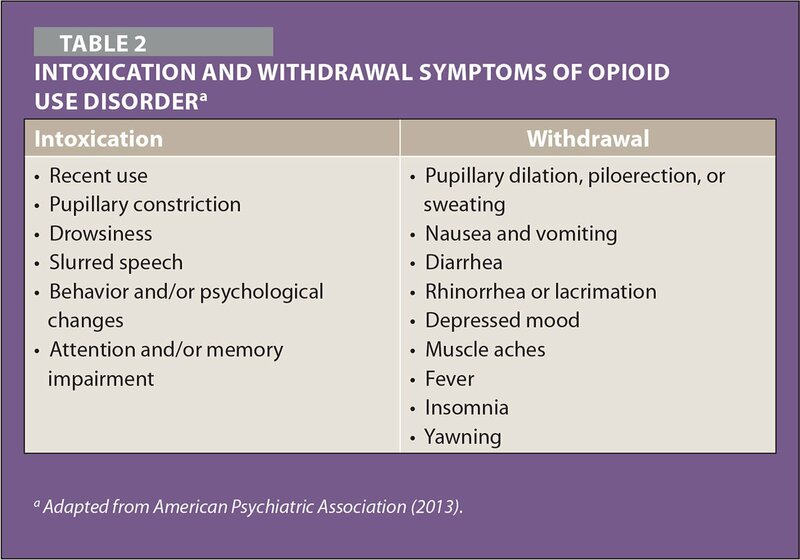 Signs and symptoms of opioid drug intoxication and withdrawal are listed in Table 2. 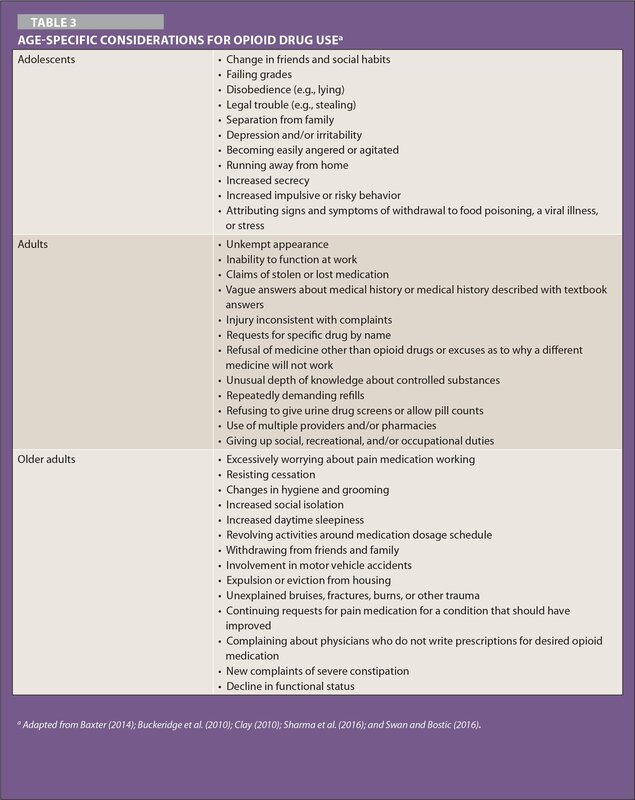 Behavioral and psychosocial aspects of opioid drug use can vary by age and are listed in Table 3. Key word searches for abuse, nursing, opioid, opiate, prescription, identify, and treatment, with limitations for full text and English, were performed using the Ovid Nursing, PubMed, and CINAHL databases. Although now an outdated term (APA, 2013), “abuse” was used to ensure inclusion of seminal works. Articles were judged based on title, keywords, and abstract to determine inclusion criteria comprising the key words and relevance to topic. Articles were excluded if they were older than 10 years (unless seminal to topic), did not include key words, or were duplicates. Thirty-three relevant articles were chosen for this limited (i.e., not systematic) review of the literature. An interprofessional literature search revealed articles in the fields of nursing, psychology, adolescent health, gerontology, and pain management and addictions journals. Clinical practice guideline literature was provided by the American College of Preventive Medicine, ANA, APA, Centers for Disease Control and Prevention (CDC), NIDA, and SAMHSA. Adolescents who use substances are eight times more likely than adults to progress to and develop dependence (Al-Hasani & Bruchas, 2011). Rates of prescription drug misuse are rising in this age group, as adolescents report prescription drugs are easier to obtain than illicit drugs, and many believe prescription opioid drugs are safe and non-addictive, reasoning that a physician would not prescribe an addictive drug (Sharma, Bruner, Barnett, & Fishman, 2016). It is estimated that 55% of high school seniors who report engaging in opioid drug misuse received medication from a friend or family member, and approximately 37% reported misusing opioid drugs from their own previous prescription (McCabe, West, & Boyd, 2013). A positive relationship exists between prescription opioid drug misuse and use of heroin, with adolescents transitioning to IV use after misusing opioids. Injection sites are commonly hidden with jackets or long sleeve shirts, making it difficult for family members to notice early signs (Sharma et al., 2016). Therefore, adolescents' opioid drug use may not become known until after school expulsion, arrest, or job loss (Sharma et al., 2016). Adolescents are highly susceptible to overdose if an interruption of opioid drug use has occurred, resulting in a loss of tolerance coupled with impulsivity. In addition, adolescents tend to have less experience with drugs than adults (Sharma et al., 2016). Adolescents with OUD will have a faster rate of deterioration in social and occupational functioning compared to adults, making it more difficult to engage in treatment and recovery as their addiction severity increases. Family members may not realize that the adolescent has OUD until access to opioid drugs is lost, resulting in withdrawal (Sharma et al., 2016). Legitimate use of a prescribed opioid drug in adolescence is independently associated with increased risk of opioid drug misuse in young adults ages 19 to 23 (Groenewald & Palmero, 2016). Adults ages 18 to 25 are more likely to misuse prescribed opioid medication than any other age group (NIDA, 2016). Reported alcohol use is positively associated with opioid drug misuse in middle-aged adults (Chang & Compton, 2016). Frequently switching physicians and using multiple pharmacies to fill prescriptions may be a warning sign for prescription drug misuse (Felicilda-Reynaldo, 2014). A positive correlation exists between antisocial personality disorder, substance-induced major depression in the past 1 year, prior posttraumatic stress disorder (PTSD), and prescription opioid drug misuse in the past 1 year (Mackesy-Amiti, Donenberg, & Ouellet, 2015). PTSD was found to be a significant risk factor for prescription opioid drug misuse (Mackesy-Amiti et al., 2015). Adults with a history of addiction are also at higher risk for drug addiction later in life. However, new-onset addiction in older age groups is rare (Clay, 2010). Mortality is higher in drug-dependent older adults compared to younger age groups (Kalapatapu & Sullivan, 2010). Substance use disorders in older adults are common, but often go undiagnosed (Fingerhood, 2000). Older adults are at highest risk and are the fastest growing group for opioid drug misuse, with approximately one half of adults ages 50 to 64 reporting opioid drug misuse (Chang & Compton, 2016). Older adults are more likely to unintentionally misuse opioid drugs (Clay, 2010). An older adult may misuse an opioid drug by accidentally taking a second dose or by taking a prescribed opioid drug for the wrong reason, such as to aid sleep or anxiety (Clay, 2010). Intentional opioid drug misuse can happen for immediate pain relief, management of negative emotions, or desire to be pain free when spending time with loved ones (Chang & Compton, 2016). Older adults are more susceptible to toxic effects of medications due to normal age-related physiological changes and polypharmacy (Al-Hasani & Bruchas, 2011). Chronic medical conditions may be exacerbated by opioid drug misuse, resulting in a higher medical burden (Kalapatapu & Sullivan, 2010). Decline in functional status is a more appropriate indicator of addiction in older adults than a decrease in social, occupational, and/or recreational activities (Clay, 2010). Functional decline in older adults can be due to an acute or chronic event, but opioid drug addiction must be considered as a potential variable (Clay, 2010). Nurses are commonly first line health care providers in recognition and treatment of opioid drug misuse and/or dependency. Early recognition may prevent death due to opioid drug use through early intervention and treatment. 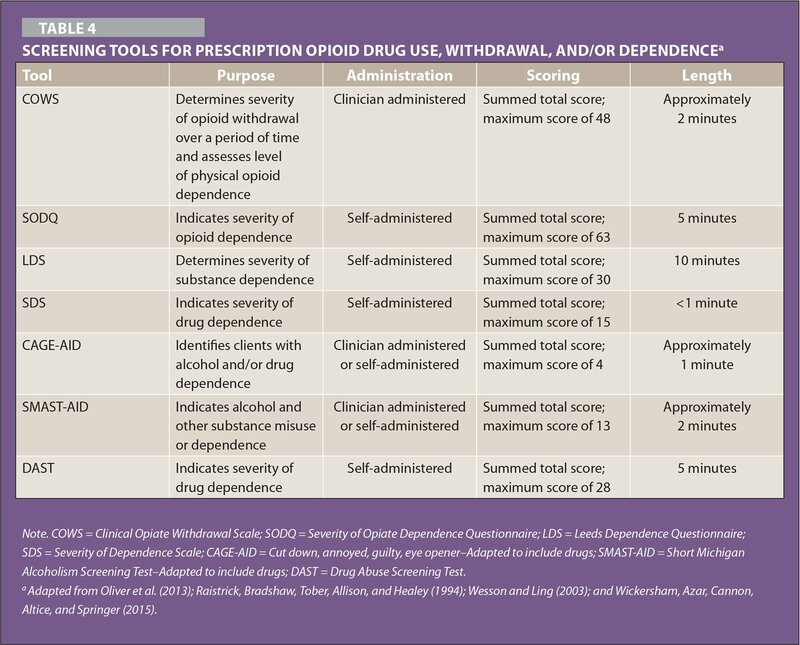 Evidence-based screening tools for opioid drug misuse and dependence take little time for RNs to administer and have shown reliability. RNs need to know and understand when each tool is appropriate for use. Screening should be performed quickly and efficiently as to not interfere with other care duties the patient may need. RNs are capable of critical thinking and have clinical reasoning skills to interpret screening tool scoring as it relates to an individual patient. Table 4 shows commonly used screening tools, how to administer them, and when each tool is appropriate for use in the clinical setting. Nonpharmacological treatment, such as counseling with behavioral therapies, is highly recommended clinically and mandated by federal law as adjunct treatment for opiate addiction along with medication-assisted therapy (MAT) (SAMHSA, 2015; World Health Organization [WHO], 2018). The WHO refers to nonpharmacological treatment as psychosocial modalities or support from professionals and non-professionals alike. This treatment focuses on psychological health support spanning from providing food and housing to professional therapy and employment (WHO, 2009). The non-professional community is able to provide support in the form(s) of friendship, belonging, and basic needs. Cognitive-behavioral therapy (CBT) has “become the leading approach in a variety of mental and behavioral disorders” (WHO, 2009, p. 69), which is extremely important as individuals with opiate addiction often experience co-occurring mental health disorders. A variety of delivery methods exist for therapy (e.g., outpatient in office, intensive in home, partial hospital services, residential). Peer support groups have proven effective as well (e.g., Narcotics Anonymous®, Smart Recovery®, Women for Sobriety). Mental health professionals are trained to use motivational interviewing to determine an individual's readiness for change. Contingency management is often used as one behavioral approach that incorporates rewards and positive feedback for the desired behavior and consequences for undesired behavior (WHO, 2009). This type of nonpharmacological intervention is easily implemented with little training needed of staff (WHO, 2009). 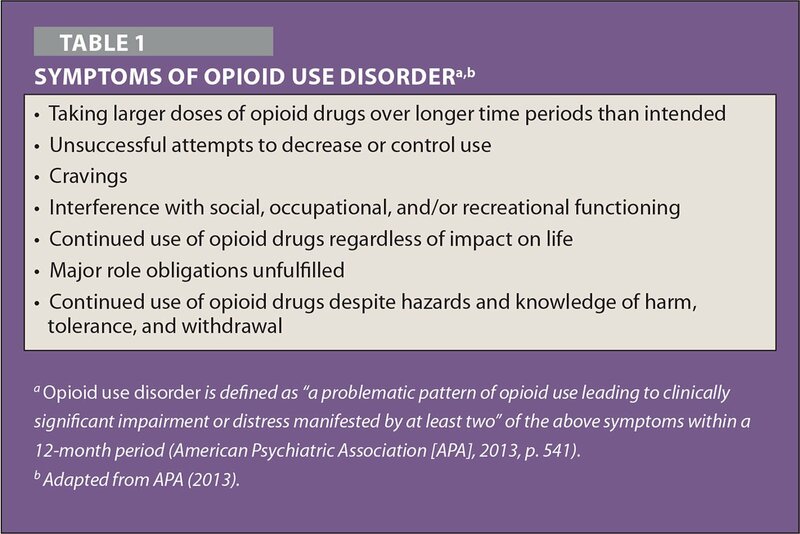 Opioid dependence is often successfully treated with a combination of psychosocial and psychopharmacological modalities. OUD can be treated with MAT; however, behavioral counseling coupled with MAT produces best results (NIDA, n.d.a). MAT is the use of medications to treat substance use disorders, primarily OUD, in conjunction with counseling and behavioral therapies (SAMHSA, 2015). Commonly used medications in MAT are methadone, buprenorphine, and naltrexone. Methadone, a long-acting opioid agent, prevents opioid drug cravings and withdrawal. Buprenorphine, an opioid partial agonist, also reduces opioid drug cravings. Naltrexone, an opioid antagonist, is used for cravings and works by blocking the euphoric effects of opioid drugs (SAMHSA, 2015). MAT has been shown to be clinically effective and significantly reduces the need for inpatient detoxification services for individuals with OUD. Treatment retention, remaining employed, and survival rates are all improved with use of MAT. Individuals in a MAT program also show a decrease in illicit opioid use as well as criminal activities (SAMHSA, 2015). Referral options may include inpatient and outpatient treatment centers and/or pain management. The U.S. Department of Health and Human Services has made naloxone access for opioid drug overdose rescue a priority for responding to the opioid drug epidemic (Kerensky & Walley, 2017). Naloxone, an opioid antagonist, is approved by the U.S. Food and Drug Administration (FDA) for emergency treatment of known or suspected opioid drug overdose (Kerensky & Walley, 2017). Naloxone may be administered intranasally, intravenously, subcutaneously, or intramuscularly (Kerensky & Walley, 2017). The 2016 opioid drug prescribing guidelines set by the CDC recommend naloxone education for patients and household members of individuals using opioid drugs, individuals with a history of overdose or substance use disorder, and/or individuals concurrently using benzodiazepine agents (Kerensky & Walley, 2017). Most states allow health care professionals to prescribe naloxone to patients with OUD and their family members (Kerensky & Walley, 2017). In a growing number of states, naloxone is available without a prescription and training to administer it is provided through a pharmacist (Kerensky & Walley, 2017). Nurses need to remain current in their knowledge of substance use disorders and pain management modalities to provide comprehensive evidence-based care. Providing proper patient education, monitoring prescription opioid drug use, and screening for opioid drug misuse and/or dependency are essential nursing-initiated interventions that may help prevent opioid drug misuse, dependence, and diversion. The opioid drug epidemic is a national public health crisis. Nurses can lead culture change by continuously advocating for patients at the bedside, in the community, and at the legislative level. Strong clinical judgement skills are crucial for providing treatment for pain relief, especially when providing high alert medications such as opioid drugs. It is essential for nurses to provide proper education about opioid medications, including education regarding differences between pain severity levels, appropriate use of patients' prescriptions, proper storage in a locked container, and proper disposal of any unused portions. Verbal and written health literacy should be targeted. Nurses should also provide patient education regarding risks of nonmedical opioid drug use and opioid drug diversion (Manworren & Gilson, 2015). Controlled substance disposal education should also be included. The FDA advises that unused medications should be disposed of through a medicine take-back program, and only flushed down the toilet or sink when such a program is not available (Manworren & Gilson, 2015). Nurses may assess patients' opioid drug use through self-report, screening tools, pain diaries, pill counts, and random urine drug screens. NPs who prescribe opioid drugs can refer to the state Prescription Drug Monitoring Program (PDMP) in the state in which they practice, with the exception of Missouri, to view patients' records of previous controlled prescriptions (PDMP Training and Technical Assistance Center, 2017). Health care providers can retrieve valuable information from the PDMP that can alert them to diversion activities and prevent over-prescribing of opioid medications. The CDC (2017) views implementation of state PDMPs as a promising intervention to protect patients, improve prescribing practices, and inform clinical practice. Nurses play a vital role in assessment, education, treatment, and referrals that will potentially decrease the possibility of fatal consequences. Expanding access to PDMP to nurses who do not prescribe controlled medications would improve monitoring. Clay, S.W. (2010). Treatment of addiction in the elderly. Journal of Aging and Health, 6, 117–189. Felicilda-Reynaldo, F.D. (2014). Recognizing signs of prescription drug abuse and addiction, part I. Medsurg Nursing, 23, 391–396. Manchikanti, L., Fellows, B., Ailinani, H. & Pampati, V. (2010). Therapeutic use, abuse, and nonmedical use of opioids: A ten-year perspective. Pain Physician, 13, 401–435. Ms. Jones is Graduate, and Dr. Arms is Assistant Professor, School of Nursing, University of North Carolina at Wilmington, Wilmington, North Carolina. Address correspondence to Tamatha Arms, DNP, PMHNP-BC, NP-C, Assistant Professor, School of Nursing, University of North Carolina at Wilmington, 601 S. College Road, McNeill Hall 2034A, Wilmington, NC 28403; e-mail: armst@uncw.edu.